Add the corn, creamed corn, butter, muffin, mix, and sour cream to a bowl and mix well. Add the eggs and mix together. Pour into a 11x17 pan that has been sprayed with cookiing spray. Bake for 35-40 minutes or until top is lightly browned. Serve with butter and honey if desired. If you want to add a little spice to this dish add a 4 ounce can of diced green chilies. I’ll be honest; I’ve never made corn pudding before because I’ve never really been a fan of it. With all of the sides at Thanksgiving, why would I waste the room for corn pudding? Oh, I was so wrong. I decided to give it another chance made my way -- and the result? I couldn’t stop eating it. I almost ate the whole pan. 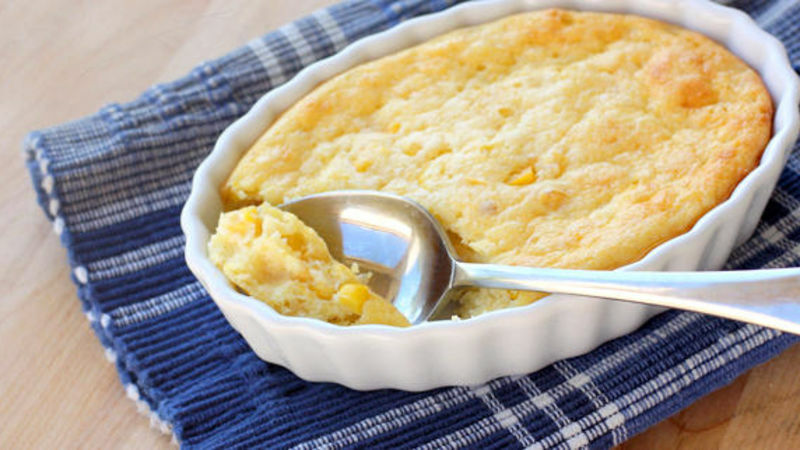 It tastes similar to cornbread, but while cornbread often leaves your mouth begging for a drink, this corn pudding is moist and full of flavor. While I was eating, I was thinking, "How could I have shunned corn pudding this for so long? How many Thanksgivings have I missed out on eating this?!" Most of my friends complain that they just don’t like cooking because it’s too hard and nothing ever turns out. Don’t worry…I’m not going to call you out by name. Well, ladies, this is your dish…Corn Pudding the Easy Way. This is a reliable side dish that you cannot screw up. And chances are, if you aren’t hosting Thanksgiving this year, then you will be asked to bring a side dish. If you are hosting and cooking the whole meal yourself, this is simple enough to not add any stress to your menu planning. Serve this with butter or honey or just all by itself. Spice It Up: If you want to add a little kick to this dish, you can add a 4-ounce can of diced green chilies into the mix.